Listen to "In Extremis: The Life of War Correspondent Marie Colvin" on your iOS and Android device. 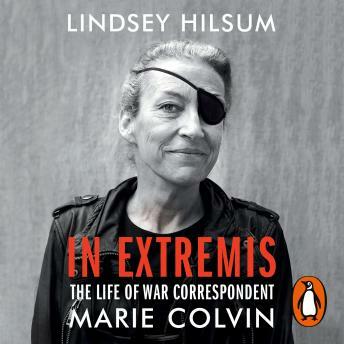 Random House presents the audiobook edition of In Extremis: The Life of War Correspondent Marie Colvin, written and read by Lindsey Hilsum. Marie Colvin was glamorous, hard-drinking, braver than the boys, with a troubled and rackety personal life. With fierce compassion and honesty, she reported from the most dangerous places in the world, fractured by conflict and genocide, going in further and staying longer than anyone else. In Sri Lanka in 2001, Marie was hit by a grenade and lost the sight in her left eye - resulting in her trademark eye patch - and in 2012 she was killed in Syria. Like her hero, the legendary reporter Martha Gellhorn, she sought to bear witness to the horrifying truths of war, to write 'the first draft of history' and crucially to shine a light on the suffering of ordinary people.